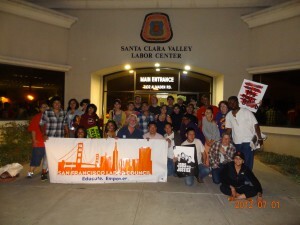 At 3 AM Saturday morning one half of a delegation of committed union members and community activists boarded a bus at the San Francisco Labor Council offices on Franklin Street to meet up with the other half of their counterparts an hour away in San Jose at the headquarters of the South Bay Labor Council. We were going on a 6-hour ride to Los Angeles for a rally to support the Los Angeles Federation of Labor and the United Food and Commercial Workers. The Council was coordinating a march to protest the plans by Walmart to burrow their way into Los Angeles’s small but vibrant Chinatown. We would be joining almost 10,000 other activists and protesters in a march from Preservation Park to a stage under the famous dragons of Chinatown. Cindy Chavez, the Executive Secretary of the South Bay Labor Council, and I agreed to organize a full-day agenda to bring Bay Area labor support to our brothers and sisters in LA. With the help of our great staff members and organizers Ramneek Saini, Dereka Mehrens, and Anna Schlotz, we filled the bus with food and educational materials for the long bus ride. We then introduced Gordon Mar from San Francisco’s Jobs with Justice who walked us through the bad labor practices of Walmart to get us primed for the huge rally we were going to support and join in a few hours. Gordon had burned three videos onto a CD which we played on the bus’s video system (Coach Line driven by our Teamsters brother). The videos were stories about and by Walmart warehouse and retail workers who were struggling to support their families on the low wages and lack of benefits in the jobs they worked hard at and depended upon. All of us on the bus were reminded that if Walmart changed their business practices to pay living wages and give workers a voice at work our reactions could change. We then opened up a discussion about what we could do — even after this huge rally (the biggest ever nationwide in this campaign) — to keep the pressure on Walmart to pay living wages and benefits. We then introduced Alfonso Pines, one of UNITE-HERE Local 2’s (San Francisco) best organizers. Alfonso finally got us ALL awake as we sped through the hot dry farmland along Interstate 5. He led us through picket line and rally chants until ALL our voices — sweet or out of tune — were engaged. And between chants and songs Alfonso talked about the connection between union chants on the picket line and the 1960’s civil rights songs that protesters created to keep themselves company when they were in jail fighting for the right to vote and other liberties. Cindy Chavez, I, and staff from the two Labor Councils engaged in discussions about various campaigns: the fight to raise the minimum wage in San Jose, the attacks on public workers’ retirement, and the campaign against the Citizens United Supreme Court decision to allow corporations to spend unlimited millions of dollars to silence workers’ voices. Helicopters were flying over. Every candidate for mayor showed up, Teamster Harleys lead the march. Rock and roll stars sang. 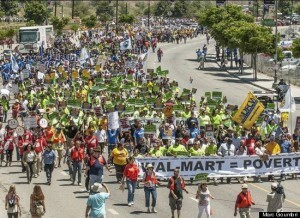 The whole city was out supporting workers’ rights! Those of us from San Jose and San Francisco were only in LA for three hours, but the effort was a great signal of statewide solidarity. The Orange County and San Diego Labor Councils also sent delegations. We returned to the bus sunburned, sweating, and hungry. Thank you to the LA Fed for supplying us with the fresh sandwiches, chips and COLD drinks that were delivered to our bus as we left the City of Angels. In San Francisco the Labor Council coordinates a rally, press conference, protest, march or local picket line at least three or four times a month. San Francisco, Los Angeles, New York, Chicago and Washington, D.C are always targets to ramp up actions due to the media markets we live in. Only once or twice every couple years do we organize and hit a critical mass where thousands of workers are pissed off enough to engage. I’m not talking about a full campaign, but a critical tactic in a campaign that resonates. This Los Angeles Walmart action was one of the visible signs in the age of economic downturn and the age of Occupy that continues to signal that organized labor and its allies are the only movement that will battle the companies that put profits before people. This entry was posted on Wednesday, July 11th, 2012 at 4:51 pm	and is filed under Blog. You can follow any responses to this entry through the RSS 2.0 feed. Both comments and pings are currently closed.